So I have officially finished my Master’s work 🙂 and I’ve written up a more extended abstract of the thesis with less technical terms below. This hopefully can give you some concise intuition on the work without the technical details. This page is meant to be a summary of all things related to this work and links to other relevant articles that I wrote. This thesis examines a) how to segment the spinal cord from 3D magnetic resonance images (MRI) using computer-aided methods, and b) how to predict the level of clinical disability in multiple sclerosis (MS) patients using spinal cord segmentations and corresponding MRIs. 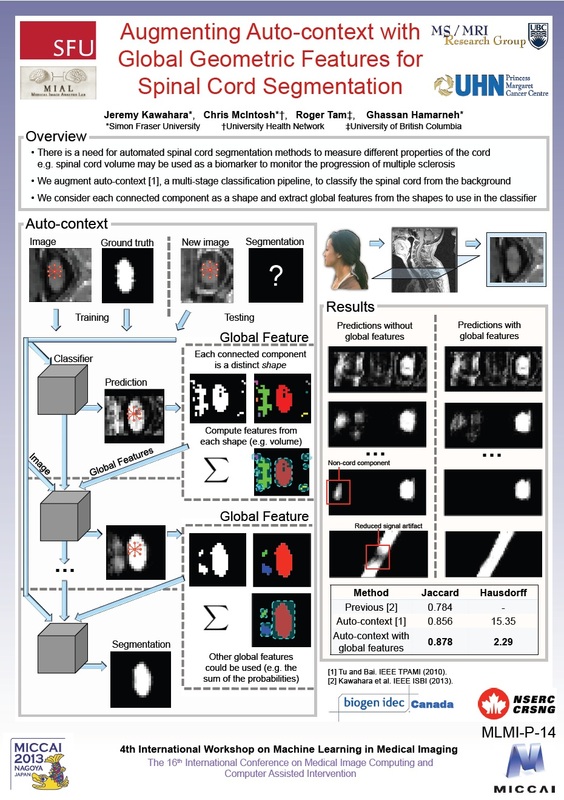 Our work on predicting the physical disability level of patients was accepted for an oral presentation at the MICCAI 2013 workshop on, Computational Methods and Clinical Applications for Spine Image, in Nagoya, Japan. Hey! Our work got accepted into the 2013 MICCAI MLMI workshop and I got to go present our paper in Nagoya, Japan! Well, I did my first ever video-recorded talk on my research on spinal cord segmentation. I think the title really summarizes the work pretty nicely so I’ll break down each part of the title to give you a brief overview of the paper. 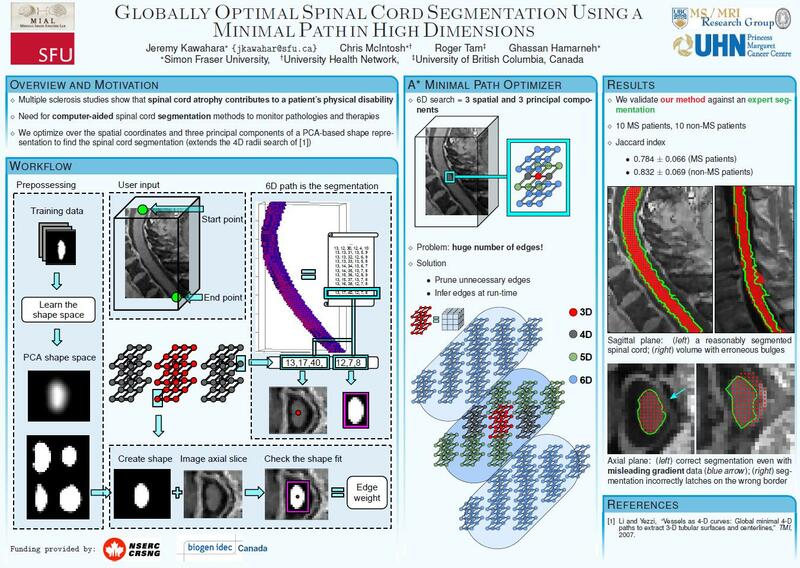 “Spinal Cord Segmentation” = this is the goal of the work. Given a 3D MRI, we want a method that can mark those voxels that belong to the spinal cord. Segmentation means to label the voxels as spinal cord or background. “High Dimensions” = we represented the segmented spinal cord by a list of 6 numbers. I’ll explain this a bit more since this a bit tricky to understand. We used principle component analysis (PCA) to represent the “shape” of a 2D slice of the spinal cord. PCA allows us to represent each shape by its center point (x,y,z) and three principle components (giving us a total of 6 numbers per 2D slice). We can represent our spinal cord as a stack of these 2D shapes, or equivalently, a list of 6 numbers. Now the question is, how to find this list of 6 numbers? Well we can search for them. This is similar to finding the shortest path in between 2 points, but instead of searching over 2 or 3 (spatial) dimensions, we search over the 6 dimensions (3 spatial and 3 shape). “Minimal Path” = a minimal path finds the shortest path in between two points. In our methods, a user enters the start and end point of the spinal cord, and we find the minimal path in 6D between these two points. We use a slightly modified version of the A* search to find this minimal path. A path is defined to be “short” if the shapes “fits” well (e.g. the borders match) with what is in the MRI. “Globally Optimal” = means that we can find the best segmentation that exists based on how we defined how well the shape “fits”. Our method will always find the global minimum and will not get stuck in any local minima. You can take a look at the paper here. Here’s the poster we did for the ISBI conference. The nice PDF can be viewed here.